Hey I thought this would be use full over here. Its a swap guide I did years ago on the HP boards that i just began updating and fixing picture links, so I hope this can be sticky post over here. Copy an paste begin. Dam its crazy how time flies bye but here we are, 2011 and this walk through is in bad shape with missing pics. So since I've been hanging out here as of late I will get this corrected and updated. This was originally a swap for just LC's but there is no reason you cant use this on a LC2 so that's been added to the title. If your using an automatic transmission your on your own but this guide should still help. Please post results so I can update this, I want to make it as universal as possible. For us Cali guys and other places with Cali like smog laws this guide can get you all the way legal after you test it at a REF station. Check your local laws but in Cali the donor engine must be the same year or newer and from the same Make, in other words no Mazda motor in your Hyundai. 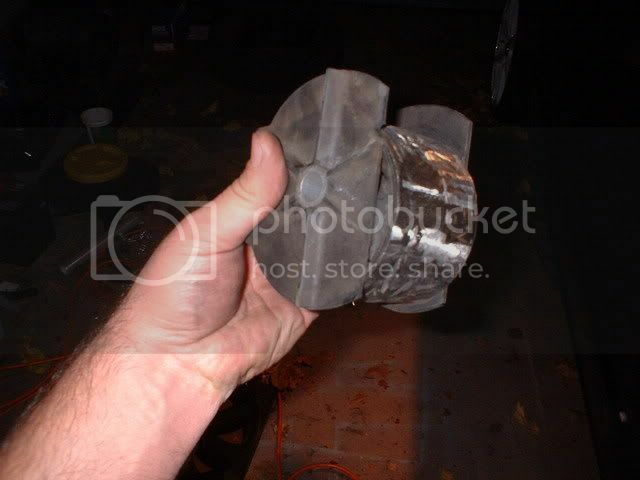 All smog equipment must function like the donor car, in this case a 2002 Elantra. The ECM must be from the donor vehicle as well and yes they attempted to inspect my ECM but gave up trying to read the numbers on it due to its difficult location. This doesn't mean that will happen to you. If ya cheat using the 1.6L Accent ECM you might get caught or you might not, your also loosing horsepower using the 1.6L ECM. After passing inspection they perform a normal smog test and if you pass that then your swap is legal. This of course means no CEL can be showing. They will put a new sticker in your door jamb stating the donor info and other things. Now this is a sticker that does give ya some more horsepower hahaha! The recipient for the swap is an 02 Accent 1.5L manual but this guide should work on all LC/LC2 models. What is going in is a Beta 2 non cvvt and a Beta 2 manual transmission along with the Beta 2 ECM. SHOPPING LIST: Basically everything I needed to get smog legal, feel free to adjust the list to your needs. Complete Beta 2 Engine from the intake filter box to the exhaust manifold and from the flywheel to the accessories. Some accessories can be substituted, see below. Complete Manual Transmission with all sensors, slave cylinder, clutch line and clutch, unless your reusing your Alpha trans then I cant help ya there. Again if you have info on this please post it so I can update this guide. ECM and maybe the engine harness, depends on how you tackle wiring, guide coming for that. Upper and Lower radiator hose's, if there good, might want new ones. Both heater core hose's, same as above. Canister close valve, including the plastic shield and long metal bracket located by the gas tank fill up area, also make sure to grab the pigtails and 12" of wire. Fuel tank pressure sensor along with pig tails and 12" of wire. 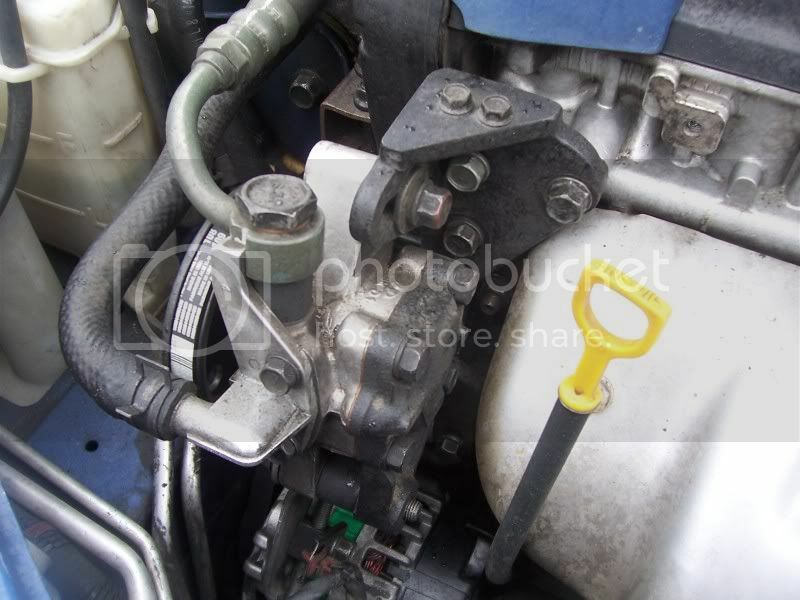 Also grab the various small tubes and fittings around the sensor, located right above the gas tank fuel pump. Power steering reservoir and bracket. power steering return line and the other main line going from the ps pump to the rack and pinion. **Smog purpose** Sounds crazy, but trust me. White faced gauge cluster. Speedometer must be sensor driven not cable driven. Also grab the pigtails with as much wire as you can get. Now here are some things you need to know before you start. transmission and 1 custom mount on the engine. 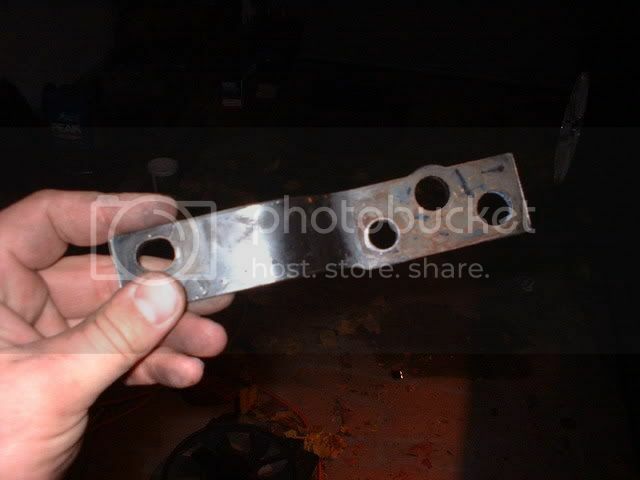 Now for the 3 brackets on the transmission you need to slot the holes 1/4 of an inch with a dremel and grinding stone. This will allow the engine/trans assembly to move 1/4 of an inch towards the driver (left) side. All transmission mount locations are the same as the 1.5L. The beta transmission is 1/4 of an inch wider on each side were the axle's clip into the differential. So of course by sliding the transmission towards the driver side 1/4" means that the passenger (right) side is back near the proper position but the driver (left) side is now out by 1/2" . The purpose of this is to get some room in between the pulley's and belts, so they can be changed as needed and there is no pounding away on the inner fender to make the beta 2 engine/trans to fit. Front bracket - slot the holes that the transmission bolts pass through for mounting the bracket. 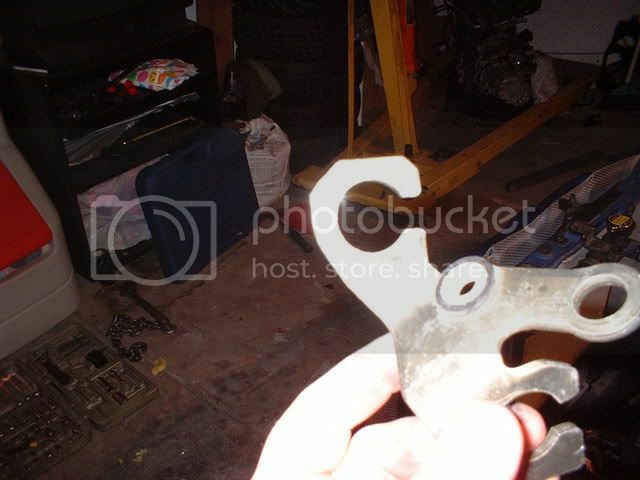 Rear bracket - same as above bracket. 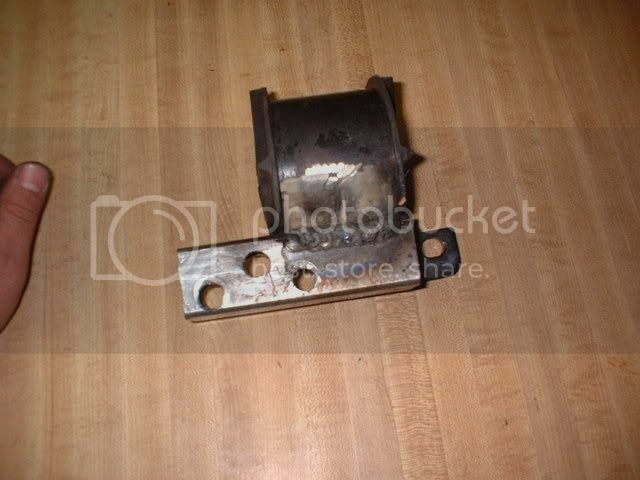 Driver side bracket - slot the holes that the roll stop bolt passes through. This is why I am sliding the engine/trans assembly over. Do you really want to pull the motor to change the freakin belts. At this position they just barely squeeze through. 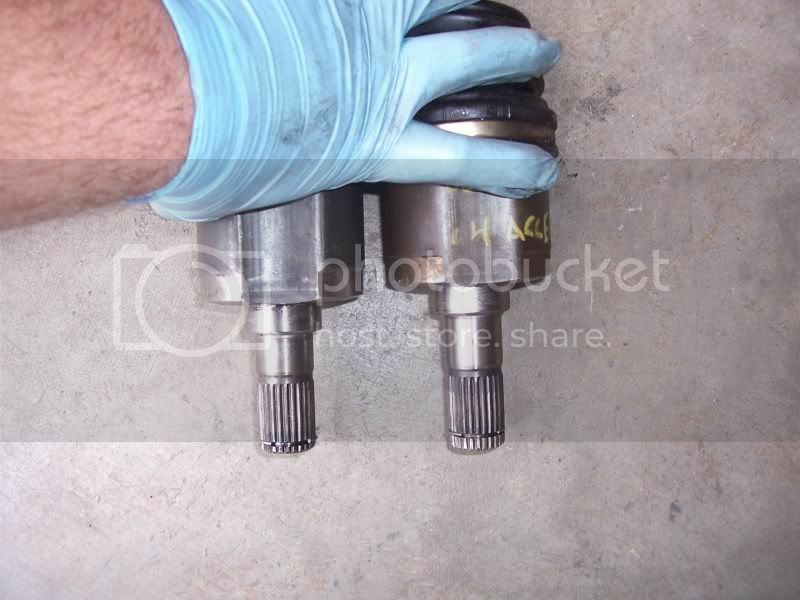 Passenger- From a 98 Elantra 1.8L automatic, the stock Accent axle fits but was leaking because it doesn't clip in. 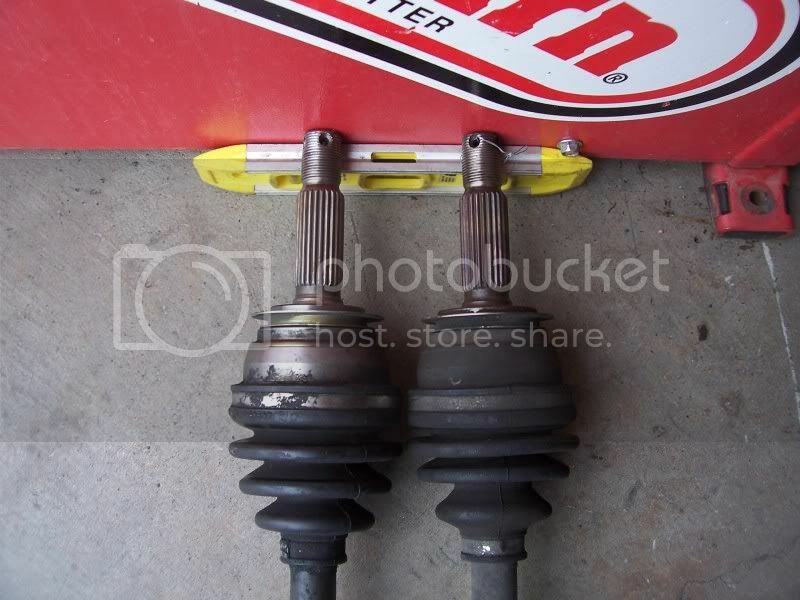 The Elantra axle is 1/4 of an inch longer then the Accent axle. The transmission spline end was 1/4" longer allowing the axle to slide into the transmission 1/4" more. This allowed it to clip in and loosing the 1/4" length advantage it had on the stock axle. Driver- From a 01 Accent 1.6L auto. 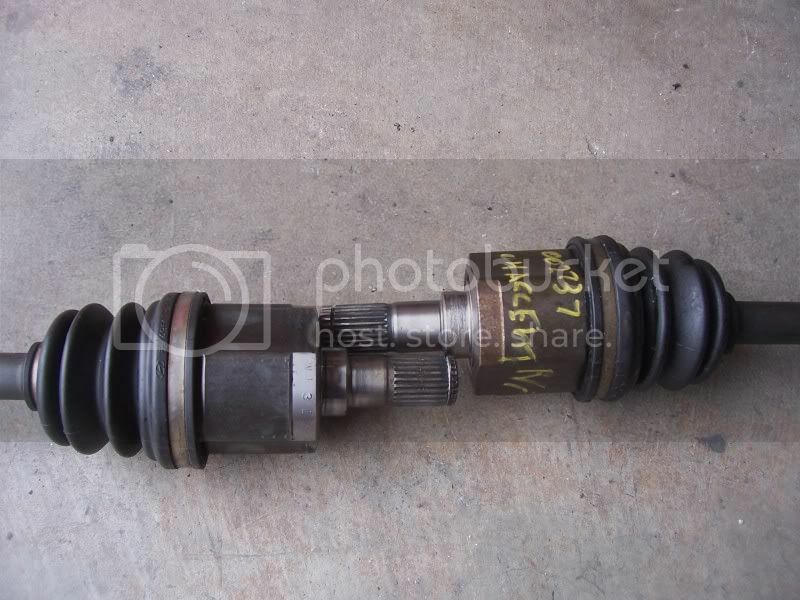 This axle is the exact same size overall as the stock axle. 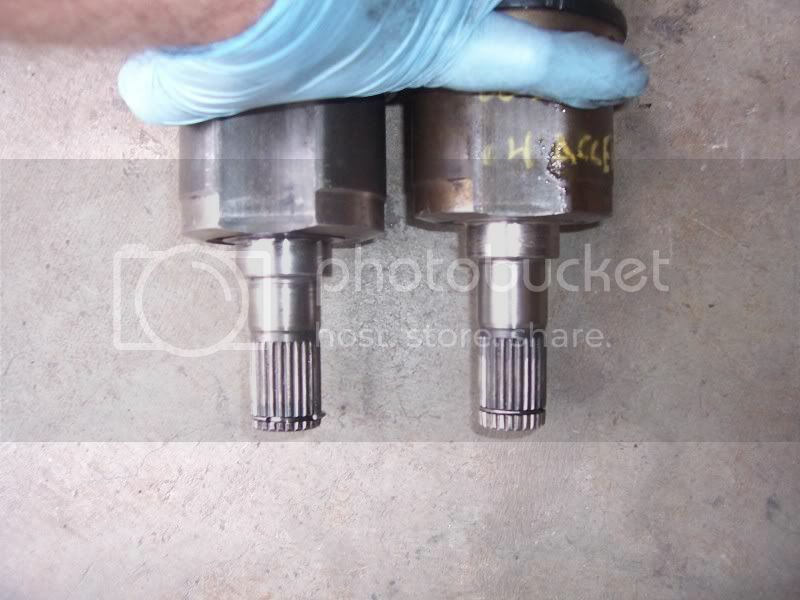 The difference is that the 1.6L is about 3/8" (9mm)longer at the transmission splines. So when you slide it into the transmission you loose 3/8" in axle length. With the axles compressed you can see that the 1.6L auto axle on the right is 3/8" (9mm) shorter at the mating surface but equal at the end if the spline. When inserted into the transmission the length is now based at the mating surface not the end of the spline, now I have a axle that is 3/8" (9mm) shorter. You can retain a/c by using all of the 1.5 a/c items. To get the 1.5 compressor to fit simply buy some 5/16th flat washers and the bolts that hold the beta compressor to the block, 1.5 bolts are too short. Now you will need 12 washers on the top bolts and 4 washers on the bottom bolts, 32 washers total. You will need a belt the same length as the stock beta belt but one tooth skinnier as the pulleys will be offset just a bit. If you already have the beta compressor the 1.5 lines will simply hook up with some minor bending of one of the lines as they will be rubbing on the intake manifold support bracket, same goes for the 1.5L compressor. You cant reuse the 1.5L power steering pump, or the reservoir or the lines. 1.6L guys you are fine as your reservoir and lines are what us 1.5L guys need to swap in. The 1.5L pump is located on the engine near the firewall, this wont work on the Beta, its location is up front in the same spot as 1.6L. Now I don't know for sure but i think the 1.6L pump will work on the Beta but I have not proven it. If someone has let me know and I will update this. You can use the Alpha alternator if you need to and i did for a long time with no issues. It did finally die and I now have a beta 2 alternator. I have used both Beta an Alpha starters so it will work, in fact I am using the 1.5L starter right now as my Beta starter finally died. 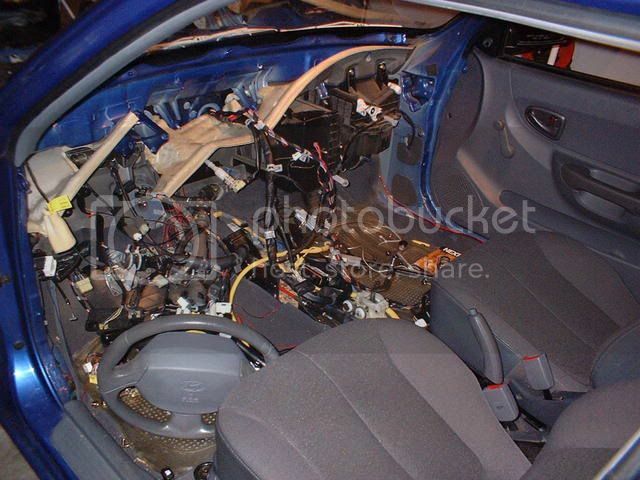 Do not have your battery plugged in at any time you remove or disconnect anything related to the Air Bag System including the gauge cluster assembly or your air bag light will be on after completion. 1- Disconnect the battery and remove the battery tray and all of the intake components up to the throttle body. 2- Drain your engine, transmission, radiator, power steering, clutch fluid and freon. used my wipers to hold it out of the way. 6- Disconnect your throttle, speedo and shifter cables. 7- Yank out the radiator and heater core hoses and pull the radiator. 8- Unhook anything else left that will prevent you from pulling out the motor Like the a/c lines at the compressor and power steering lines. 9- Now break out with the engine hoist and hook up your alpha engine. You can pull the engine/trans as one piece. Relieve a little pressure off the mounts and pull the front and rear mounts off first. 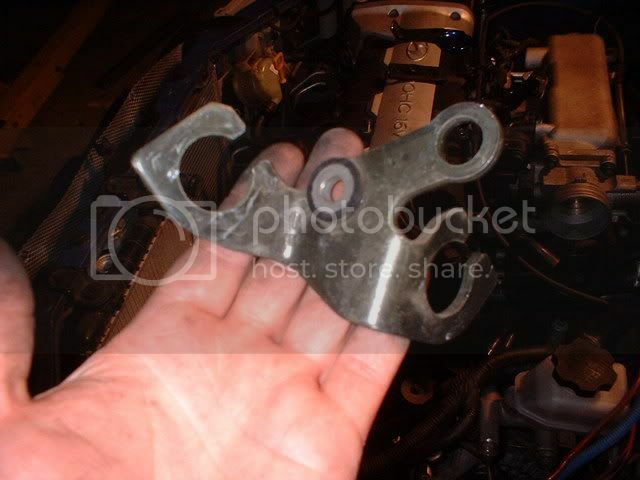 Remove the other 2 mounts and begin to pull your engine/trans out. 10- As your coming out look for anything else you may have missed that needs disconnected. got it all? Good pull it the rest of the way out. 2- Once your back to the harness you will need to disconnect it from the ECM, 2 body harness connections and any other connections it will have. Then free it up from hehind the gauge cluster area and pull it out of your car going into the engine bay. Disconnect the harnesses remaining connections in the engine bay at the fuse box an any were else as needed. the 4 holes but it will be sturdy. Reinstall into car. 4- This is were a prewired harness will come in very handy, if you have one it will save a ton of time. the harness from the engine bay to the cab when the motor is installed so get it in first. the harness is back in the car. Plug in all connections in the cab. together yet in case you have to trouble shoot. If I were to do it over again i would have just modified my existing 1.5L harness, swapping all the wires at the ECM and then adding anything else needed, like swapping the Maf plug for a beta map plug, using the same wires and anything else that needed changed. I think in the long run its easier then swapping in a beta 2 Harness. I have a link I need to find that discussed this, once i find it i will update it and link it in. You really should do most of this before you start the swap but if you didn't now's the time. 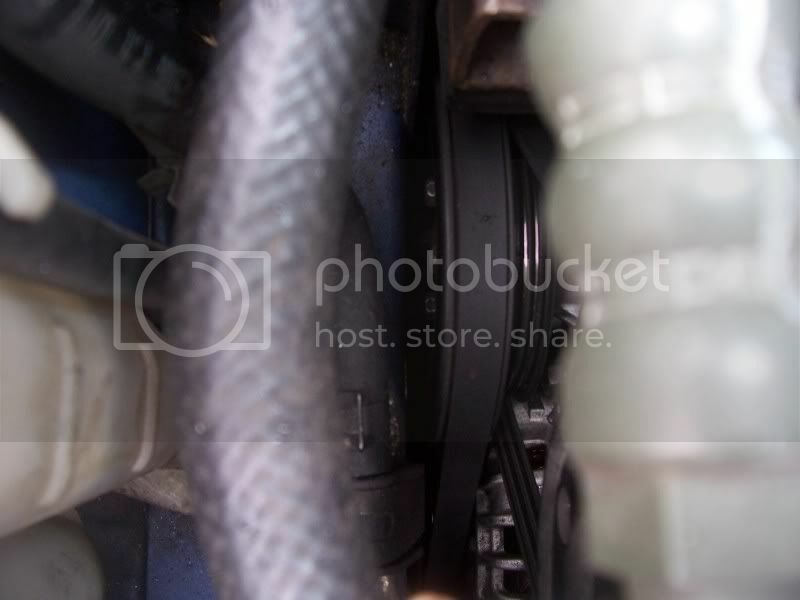 1- Replace the timing belt and all the other belts you will be using. Detail, paint or whatever else needs done do it before it goes into the car. 2- If you didn't get an alternator with the Beta you can use the one from the Alpha. 3- Put your power steering pump and A/C compressor on if they are not already. The 1.5 Alpha power steering pump will not fit. The a/c compressor will not fit without modification, I don't know about the 1.6 alphas. 4- Pull the speedo connection cable off of the alpha trans and put it on the beta trans only if your staying with a cable driven speedometer. 5- You will need to pull the shifter cable mounting bracket off of the Alpha trans and replace the one on the Beta trans. You will have to cut a corner off to fit it around the starter, either the Alpha or Beta starter, I don't remember at this point for sure but im almost positive it was the Beta 2 starter your notching for. 6- The reverse light sensor needs modified to accept the alpha transmission bracket. I broke away the plastic on the reverse sensor plug on top of the transmission leaving the metal prongs exposed. I bent them over and soldered new wires (about 10 inches) with a new pigtail then covered the exposed prongs in JB weld to seal it. Then I cut off the old reverse sensor plug from the harness and attached the adjoining pigtail to work with the one i added at the sensor. 7- Now for the Accent. Get that engine bay cleaned an detailed, it will never be any easier with everything out of the way. want the 1.6 LC reservoir, return line and the other main line on the power steering pump. 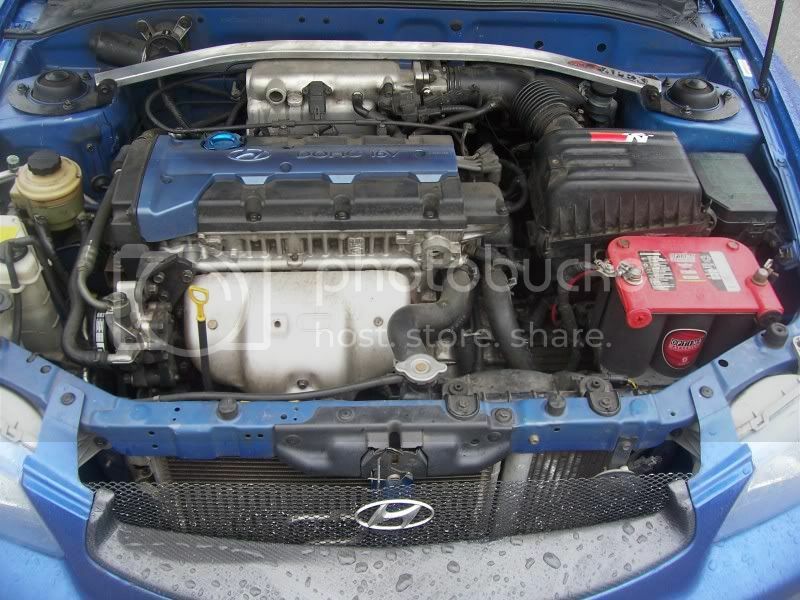 The 1.6L pump may work but I have not yet proven this. Uninstall the 1.5L power steering items and put the 1.6L stuff on. 1- Now that the motor is prepped it's time for it to go in. It is a very tight squeeze but if you get the transmission angled low enough it will go in. 2- Front transmission mount bracket needs to be slotted 1/4 of an inch on the right side of the holes (2) assuming your holding the mount in the same way you would be installing it. 3- Rear transmission mount bracket is to be slotted 1/4 of an inch on the left side of the bolt holes (3) assuming you are holding it like you would be installing it. 4-Driver (right) side bracket needs to be slotted 1/4 of an inch through the bolt hole that the roll stop uses, not the holes that the bolts pass through to mount to the trans. Slot it towards the passenger side. 5- Ok, the passenger mount. I cut everything off the roll stop with a grinder. Then remove the rubber insert, clean and reinstall with some lube. 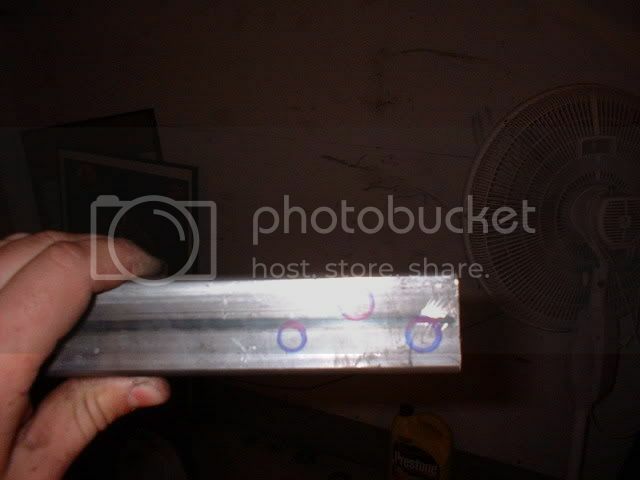 6- Now take a piece of square stock 1 1/4 by 1 1/4 inch with 1/4 inch wall thickness and about 6 inches long. Trace out the holes with this piece and drill. Now the holes on the bottom were bigger because the bolts taper. 7- Now start hooking things back up. Electrical, hoses, cables, power steering, a/c and everything else you need for it to run. 8- Now you need to tackle the exhaust. You will have to do a little customization down there. Or skip this and continue if you plan on having a shop do it. 9- Get you axle's in, wheels on and back on the ground. 11- Fill with fluids and try to start her. If she started then congrats but your not done yet get that interior back together, if not then start troubleshooting. Yes, and they all interchange.